What is Content Type Hub in SharePoint Online? In SharePoint, The content types you create in one site collection can be used only within that site collection. To provide the ability to re-use them across different site collections in the tenant and standardize, we've to use content type hub. 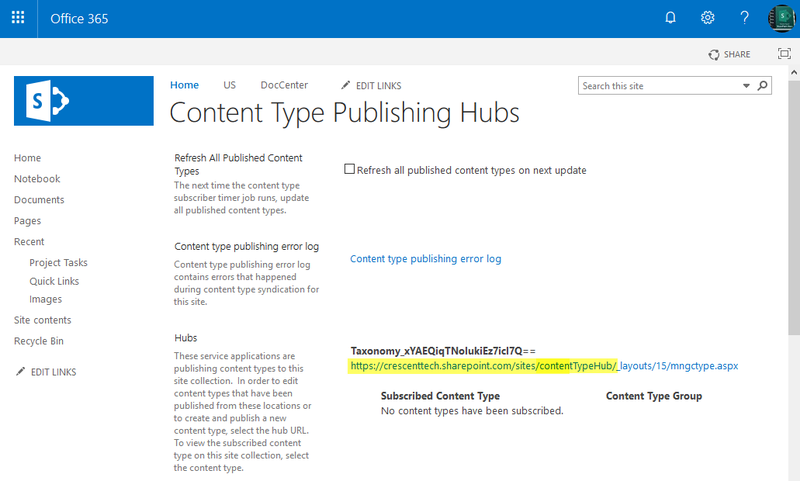 The Content Type Hub is a centralized location to manage content types in SharePoint Online. A content type hub is a special site collection configured to provide content types to other site collections. Without content type hub, You'll end up re-creating same content type and site columns again and again on all of the site collections. How to Create a Content Type Hub in SharePoint Online? If you try to create a content type hub site (instead of using pre-built content type hub site) and publish a content type from it, you would get an error! 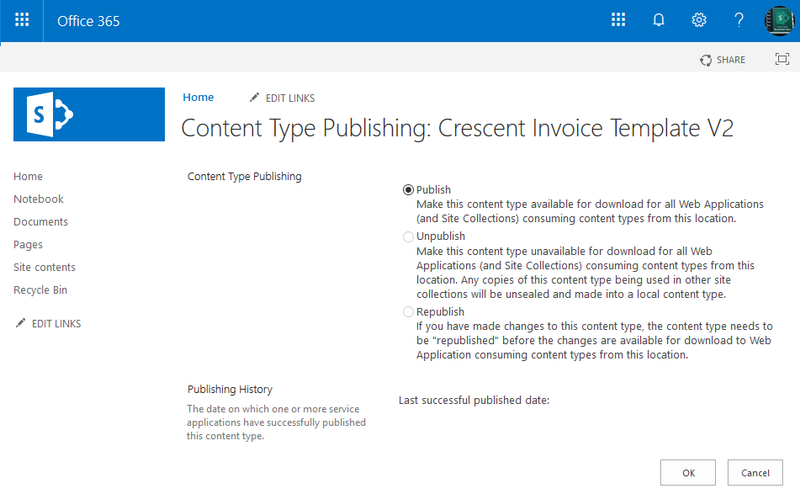 Click on "Content Type Publishing" link under "Site Collection Administration"
This gets you the content type hub URL in SharePoint Online. Create all content types that you want to reuse across site collections, in the content type hub site. Publish the content types at the content type hub. The published content types will become available in the consuming site collections after the content type hub timer jobs run. How to Create and Publish a Content Type in the Content Type Hub? The creation and publishing of content types must be done from the content type hub. Go to the Content Type Hub Site >> Click on Site Settings >> Site Content Types >> Click on "Create" link, Name your content type, add required columns, template, etc. In the Content Type Publishing page, choose "Publish" option and hit "OK" button to publish the content type in SharePoint Online. Content types must be published on an individual basis. If you make changes to a content type in the content type hub, you will need to republish the content type for your changes to propagate. Similarly, if you no longer want your content type to be available, you can unpublish the content type. However, unpublishing will not remove the content type from a subscriber site if that content type is already in use. Enable the checkbox to "Refresh all published content types on next update". This updates all published Content Types the next time the Content Type Subscriber timer job runs (can take up to Four Hours in my experience!). When a content type is published from the hub to a site collection, the published copy of the content type is considered to be "sealed" meaning that it cannot be modified. All modifications to this content type must occur within the context of the content type hub.